Share this article with your employees so that everyone can help keeps cows and calves comfortable and healthy this summer! The hot summer months can do a lot worse than make workers irritable and uncomfortable. Heat negatively affects cow performance in many ways. It can reduce fertility as well as decrease feed intake and milk production. Dairy cows can begin to feel mild heat stress when temperatures reach only 65 degrees, but relative humidity also plays a role. When humidity is higher, cows begin to experience heat stress at a lower temperature. Signs of heat stress include increased respiration and rectal temperature, panting, foaming at the mouth and bunching. Make sure the cows have enough water. Keep waterers clean and full of fresh water so that cows are encouraged to drink more. Keep an eye on cow cooling devices? fans and sprinklers should be in good working condition in order to maximize cow cooling. Keep stalls bedded and clean to entice cows to lie down and not bunch in the allies. Try to leave cows alone during the hottest times of the day. If possible, complete herd work in the early morning when it is still cool. Extra precautions need to be taken with calves as well. Chill colostrum quickly using an ice bath or bottles of ice in the colostrum, then refrigerate or freeze. Hot weather allows pathogens to reproduce quickly, so even a short time at room temperature can drastically reduce colostrum quality. Monitor grain pails closely and replace grain before it becomes soggy, moldy, or otherwise undesirable to calves. The fats in calf grains can go bad very quickly when it?s hot, leading to a rancid smell that turns calves off from it. Calves, too, need to have fresh water provided at all times. Scouring calves or calves off feed should receive electrolytes to prevent dehydration. Don?t skimp on cleanliness! Bedding should be kept fresh and dry to control flies. Rinse and wash feeding equipment that comes into contact with milk in order to prevent the buildup of biofilms- and bacteria. 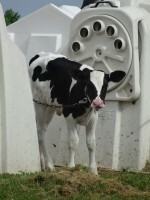 For more information on calf care during summer months, visit the Calf Facts & Calving Ease pages at www.atticacows.com.